As government leaders have become more dynamic and innovative in how work gets done, the roles of project managers and business analysts have become more prominent in government organizations. These people are catalysts for change, but they do more than inspiring others to do things differently. They bring about the change organizational leaders and stakeholders want to see. Business analysts seek first to understand the organization as it is and then imagine how it could be in the future. They shape their understanding of the desired future state by listening to leaders, stakeholders, subject matter experts and project team members. Business analysts then devise ways to get the organization from where it is to where it wants or needs to be. They are the fresh set of eyes many problems need. They come into a situation without the preconceived notions held by people who routinely deal with a project’s subject matter. Business analysts ask the dumb questions without looking stupid. They question the fundamental assumptions everyone else takes for granted. For people who like to solve problems, business analysis is a great field. Business analysts primarily work on project teams. They may be organizationally attached to an information technology department or a project management office, but day-to-day, they work in cooperation with their project managers. They often work on more than one project at a time, so they constantly reevaluate their priorities and deadlines. Business analysts are assigned to a project team to perform a variety of tasks. Early in the project, they gain an understanding of the organization’s business processes relevant to the project’s goals. They document those processes to help refine the problem the project is trying to solve. Documentation almost always involves diagrams modeling how work is done. A critical piece of this work is figuring out how the actual work differs from established policy, procedures and protocols. Once everyone is on the same page with how processes work and what the problems are, the project team brainstorms requirements a solution needs to have. The business analyst participates in requirements gathering to ensure his or her knowledge has as much depth and context as possible. After the team comes to agreement on the best options for a solution, the business analyst tries to hammer out the details. When this work begins, it is important for the business analyst to have a good understanding of how technological solutions are implemented. The business analyst does not have to be a computer programmer, but he or she needs a rudimentary understanding of how technical systems work and how the work of changing them is done. A business analyst’s solutions must be achievable for the programmers. The business analyst is critical to a project’s success because he or she has an understanding of both the business side and technical side of things. The project manager often has this knowledge but not to the degree the business analyst does. 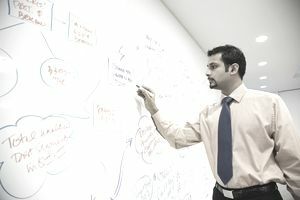 A business analyst can translate technical jargon into something project team members can understand, and they can translate organization-specific lingo into terms computer programmers can incorporate into their mental framework. As solutions are implemented, the business analyst ensures the technical work meets the business needs. The business analyst may also be involved in system testing and the creation of user manuals. Business analysts like to solve problems. They tend to follow Stephen Covey’s fifth habit of highly successful people: “Seek first to understand, then to be understood.” They understand the organization as it exists; then they try to change it. They are visionaries. They are not bound by the way things are. To business analysts, the way things are is merely a starting point for a better future. They question assumptions and strive to look at things differently than anyone else does. They offer alternatives and are not afraid of their ideas being shot down; however, they press naysayers on why they say something cannot work. Business analysts’ innovation can frighten people at times because people generally have an affinity for the status quo if for one of two reasons: fear of the unknown and fear that change will devalue their institutional knowledge. Business analysts are detail-oriented. They want to know every single fact about a process. They pick at every little facet to see how things work. They are just as diligent in their documentation. They want their documentation to be clear and comprehensive. If a business analyst has a flaw in his or her communication skills it is usually being too detailed for the audience, but they generally communicate well orally and in writing. IIBA offers two certifications for business analyst: the Certification of Competency in Business Analysis, or CCBA®, and the Certified Business Analysis Professional, or CBAP®. In the same way, the CAPM® and PMP® are graduated certifications for project managers, the CCBA® and CBAP® are two levels of certification for business analysts.